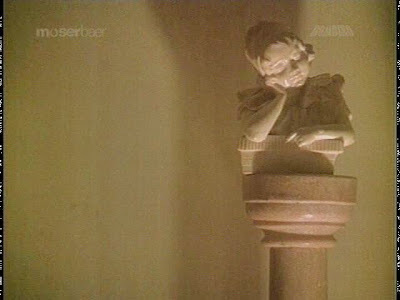 A sculpture in a hospital shows my mood while watching this stereotype-indulging, slow movie about clueless, unthinking people. Bored and in pain, though at least Memsaab kept me company. and two scenes of Shammi provided any relief. And I include in that R. D. Burman/Gulzar/Asha Bhosle's award-winning music, which hit my ear as overly synthesized and cheesy. The bulk of Gulzar's Ijaazat, based on a story by Subodh Ghosh, is a flashback of the story of Sudha (Rekha) and Mahinder (Naseeruddin Shah), who meet unexpectedly in a train station waiting room one rainy night. 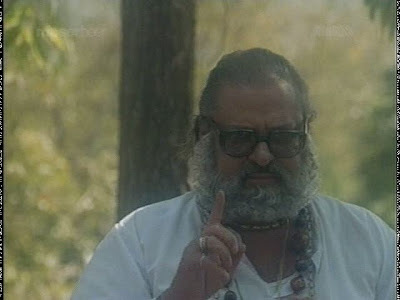 This long-suffering, bad-decision-making doormat and self-centered, wishy-washy, spoiled brat were married years ago, set up by her family friend/his grandfather, played by a kindly, prayer-spouting Shammi Kapoor sporting a truly excellent beard. They liked each other well enough, but Mahinder was actually in love with the appropriately-named Maya (Anuradha Patel), a manic (-depressive) pixie dream girl the likes of which I have not yet seen in Indian cinema. See how free-spirited she is? So unconventional! So intimate! So darling! Vomit! Mahinder loves his grandfather too much to upset him, though, so even when asked point-blank if he loves someone other than Sudha, Mahinder denies it, then frantically searches for Maya, who, showing her true colors from the get-go, is nowhere to be found, leaving notes and poems in her wake. Maya continues to reappear throughout the early days of Sudha and Mahinder's marriage, causing pain to everyone. Sudha is distraught that her husband so clearly loves somebody else but tries to put on a brave face and behaves far more charitably towards Maya's physical and emotional baggage than anyone should ever be expected to do. Mahinder can't make up his mind whether he is through with Maya or not and masochistically refuses to extricate himself from her clutches, answering her calls and rushing to her side when she pulls attention-getting trauma-drama. Maya pouts and giggles like a thirteen-year-old, even writing her romance on her t-shirt. It says "I love Mahinder" in pink script. RUN AWAY! She might as well just write "I'm a fractured little doll, and I know you'll fall over yourself to protect me from my demons." Why Mahinder is attracted to this, I do not know, but then again, I'm also baffled in real life when people value unpredictability and brokenness over smarts, humor, and stability. The film overstates Sudha's perfection, but she's clearly a good, affectionate person who uses her brain and her heart. I'm none too pleased about what this movie seems to say about women: they're shown to be mostly doormats (Sudha), unthinking flakes (Maya), or despondent criers (Sudha's mother Parvati, played by Sulabha Deshpande). Though they are not catty or cruel to each other, as women are too often portrayed, they are either self-damagingly (is that a word?) forgiving (Sudha) or inappropriately familiar (Maya, who refers to Sudha as "didi," as though she's a member of the family). Even the title - "leave; permission to depart; sanction," according to my Oxford Hindi-English dictionary - is maddening. Mahinder has made it all too clear that he does not really value Sudha or their marriage, certainly not in the way she wants/needs, so why on earth should she be concerned about what he thinks of her decisions? Like Suhaag, this movie takes long-suffering idealized wifeliness to a new level. Unlike Suhaag (and probaly many others), here a woman finally does make the decision to leave, and she does with a refreshing lack of drama or fanfare. "I'm done here," her actions seem to say. And thankfully she remains done, even after the train station confessional in which Mahinder spills out all that happened with Maya after Sudha had left. * She is not unfeeling toward him, but she does not re-engage with him for more than a few seconds. I like that she is still warm and thoughtful but sure of her own path, rather than just shutting him down and walling herself off (even though that's such a tempting option when someone has treated you like crap). On the plus side for the movie, it is the women who cause most of the movement - it might be giving Maya too much credit to say she really has much volition and actually makes deicisions, but her...behavior, let's call it, and the things she says send Mahinder reeling and jigging to her tune; he mostly reacts throughout life, even ignoring opportunities to simplify or disengage from dangerous or complicated situations. I don't agree with most of Sudha's decisions (or the unspoken rationale she appears to be operating by), but she does seem to make them. Just look at Sudha and Mahinder's belongings in the train station: she is controlled and neat and out of the way (like a good little wife, the movie might be saying); his stuff is in a jumble, right in the center of things. In fact, Mahinder couldn't find his suitcase key and had to borrow one from Sudha, whose bag was by the same manufacturer. He's such a mess that he still needs her reliability, years after their separation. In short, I don't know why anyone would want to make a story about these three people - or watch it, since people did actually bother to make it. Like Bombay Talkie, there's little but misery here, and I couldn't even feel sorry for the characters, since Sudha and Mahinder both had the ability to stop the flow of drama and suffering they felt, and Maya was just too irritating and foolish to feel anything towards whatsoever. The performances are good - quite strong in moments, especially in the few bursts of humor - but you can see good performances from these people elsewhere. A note on production: I almost forgot to mention how horrible the sound is - footsteps in particular are way too loud. 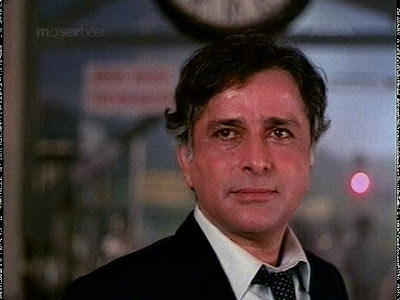 Gratuitous handsome almost-fifty Shashi picture! Upgrade! That's a gentlemanly "in yo' face" to all the man-children out there. I love how the presence of Shashi immediately demonstrates how living well is the best revenge. If this movie had been half as long, it might have been worth sitting through just for Shashi; as is, that's a tough call, even with such an effective little role. More favorable takes on Ijaazat can be found at Old Is Gold, A Walk in the Clouds, Bobby Talks Cinema, and Sen's Spot (by the author of the Alternate Movies blog). I have to state for the record that I completely disagree with the latter's statement that "This is a must see for all the women folks"; I guess the last few minutes serve as hope that people can learn from their mistakes and move on to better things, but surely that's a lesson for both genders. 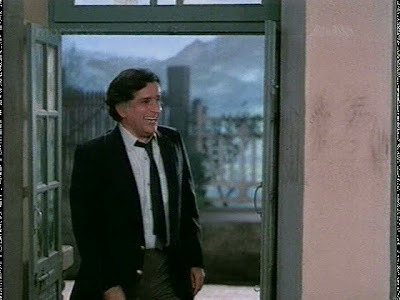 Plus the ending scene seems a little too close to "knight in shining armor" for my liking, and as we all know, heartbroken and sad as you may be, Shashi Kapoor is not going to burst through your front door and whisk you off to your new, improved life. This is the first of my new stash of twenty movies from Si, who has been doing archival research in India and graciously sends me treats. My collection is now chock-full of Dharmendra! Woohoo! Also, I think someone with the skills (ahem) should make a video of Rekha dancing to "Single Ladies." * Other bloggers have interpreted the final scene differently. ** Kidding! Man-(even-Shashi! )-saves-woman is an "avoid, yaar!" for sure 'round these parts. Ha ha! We both use living well as the best revenge and upgrade when discussing the magical and much-needed appearance of the Shash. Awww... You didnt realise that Shashi only comes in for a brief cameo? Agree with all you said about the characters, especially about Maya's. I guess I was more forgiving because I expected to HATE it (I usually do in movies of this sort, especially when everyone says I WILL like it!) and found it a lot less annoying than other triangles like Silsila. Its a bad movie, but so well put-together. The acting, the dialogues (the language is really effective and beautiful, though wouldnt sound special in translation), the cinematography and some of the little touches (the Naseer-Rekha shared moments, for e.g.) are all so well done and there is so little scenery chewing (yes, I do like its absence now and again!) that I kind of liked the package inspite of not liking the story. i gotta echo memsaab- been v depressed, and ur post induces smiles- thanks. eh ive alreayd comments on memsaab's post but i just wanted to add i agree with you on Maya's character and also that they haven't shown much of that type if character in indian cinema. or when they do, they throw in them being crazy or psychotic along with it. Oh dear, I have avoided this so far and I think I will keep avoiding it. Movies attempting to be worthy in some way, shape or form frequently don't appeal to me and I have enough other sources of almost fifty Shashi with greying temples (not that those are necessarily good movies). Well...maybe you should give me more guidelines for selecting movies. I have no idea what I'm doing, I just grab randomly and check it against the list to make sure you don't already own it. I never did get around to seeing the movie. This plot of estranged couple meeting on railway station is too, too boring. Specially accompanied by some 'soulful' music. Yes, totally avoid, yaar. Memsaab - Those are the right words to use! :) ShammiShashi zindabad! I'm trying to decide if I found this less annoying than Silsila. Probably. You're right about the acting - Naseer's one indulgence during his heart attack scene really stood out as over the top. JJC - I'll be on the lookout for more examples. Banno - The set-up actually appeals to me, and I have nothing against movies that consist mostly of conversation (or of flashbacks). But the conversation needs to be interesting and the people need to be the types I would like to spend several hours with. As Memsaab said, these are the kinds of people I try to avoid-yaar in real life, so watching a movie about them does not appeal. I'm totally mystified why the music is so beloved. I'll have to give it another listen. I think I enjoyed your write-up waaaay more than I would enjoy this movie. There is no point in searching "rational" over behavioral choice of the characters. (O why o why didn't she make the obvious choice) and how the audience or a hypothetical average person would not have made the same choices. If audience is not fluent in Hindustani then I _think_ it is very tough to understand most of the dialog as they do not carry the essence in English subtitles (like most of Urdu ghazals loose there appeal totally when translated in English). It might not be a great cinema but it is adorable (at least to me). I agree with TheQuark's comments. Its really a good movie and I really enjoyed it. I remember really liking this in the late eighties, but I've never revisited it since. Sigh. I'll add Ijaaazat to the list of things that seemed profound when I was thirteen. hey Beth, I have a copy of this that I haven't even opened, and guess what? I think when the day eventually comes for disposal of my estate, this DVD will be on the list and still in mint condition. Filmi Girl - Yeah, to me it had a ponderous feel and reminded me of a stereotype of why some people hate "art films." Sadly I'm not sure he is. If he does, he'd better have arms of steel, as I think he will be making several stops across North America. TheQuark - Ooooo. At first I thought "Well no, of course they're not necessary." And then I thought "Hell yes they're necessary! When all women, or even a significant majority of women, have true equity with men, then such roles can be downgraded from necessary." And then I thought "Well, it's just a movie." And then I thought "Nothing is 'just a ____.' It's all part of human expression and experience, of art, of culture, and it all shapes how we think and behave." And then I realized I need more coffee. More specifically, though, I'm saying that's what I like, what I respond to in a story - if I feel they're thoughtfully done and fit the context of the story and what the project is trying to do. I don't like all "strong" female roles or depictions (the big fight scene in Chak De India, for example). I totally agree that it's likely that my lack of Hindi means I missed a significant component of this movie's appeal and artistry. That's why I didn't (and rarely do) talk about the dialogues - I know I can't say anything intelligent about them. I'm also happy to admit that there might be aspects of the story, characters, etc. that I would like more (and understand more) if I experienced them in the original language. Niranjana - You've described this perfectly - I think I would have thought this was brilliant at 13 too. I also thought taping up little scraps of paper with scribbled They Might Be Giants lyrics all over my bedroom was profound. Then again, sometimes we're right when we're 13 - I loved the Beatles then and I love them now - so I will not judge anyone for thinking this is profound when they're an adult. It just wasn't for me. Temple - I'm beginning to feel guilty for what I've said. My overall impression is that this is a generally well-regarded film. Left me cold, though. You could always watch it just to enjoy Rekha's humongous 80s glasses (I had similar ones myself back in the day). I'm really hoping someone makes that video! I don't know how, nor do I have enough Rekha movies to get the right moves. Apu - I didn't forget the music. I just didn't like it. In recent times, I think the best curtain call on the suffering woman episode has been that on Konkona Sensharma's character (Sona) in 'Luck By Chance'...she forgives but does not forget; she recognises the pattern of selfishness latent in Farhan's character (Vikram) and moves on in life with a Blakean wisdom. There was tragedy in her character, but it was strangely true to life today in that she did not relapse into narcissistic self-pity and oblivion or provoking a futile sympathy in the audience or dancing into the sunset with a second, kinder hero type ; she just concentrated on fulfilling her own dreams and finding happiness in her own small achievements specific to her time, place and condition. The film was achingly optimistic. Needless to say, in that case, you completely missed the essence of the movie..the essence of maya..the context too...something which one might expect from our euro-centric audience..and I say euro-centric, not in a manner of making a value-judgment, but as an empirical fact. Sorry, you just completely missed it..
Hi Beth, this is the first time I am visiting your blog though I am a regular at memsaab's. Lovely blog - I think I will become a regular here too. Loved your review of Ijaazat. I saw this movie for the first time only yesterday (had heard a lot about it - all GOOD stuff !!!). - found the movie painfully slow. Some movies need slow for effect. This is not one of those. - The character of Maya is one of the most irritating I have ever come across. I just cannot stand such people. - Mahender (Naseer) was also a pretty pathetic character. No backbone, no respect for his wife. Did not deserve her. - I actually felt sorry for Sudha (Rekha). She should not have married Mahender at all. She probably thought he would forget Maya after marriage - poor judge of character. - Gulzar's movies are known for their poetry and dialogues. This one is no different. I love the lyrics of "mera kuchh saamaan" - but the sight of Maya irritated me so much that I did not even enjoy the song. - the whole movie could have been finished in 30 min but was stretched painfully over 2 hours. I know a lot of people loved this movie - I am not ashamed to say I am not one of them. And it is not as if I do not like parallel ("art") cinema. I do - but somehow this one does not cut it for me. Lots of interesting conversations goin' on! Cool! Casaurina - That sounds SO good! I tried to rent it a few weeks ago but the stupid pirated DVD wouldn't even work after a few minutes, so I gave up (the sound was terrible anyway). Someday I'll get to it! I love stories where people can learn and move on as individuals - since that's all we can ever hope to control/shape anyway (and not even all of that, of course). The idea of thing being better by the stamp of approval of a more appropriate partner is...well, an improvement, I guess, but still external. That's one reason I love Muriel's Wedding so much - the friends go on on their own. Raazi - I'm not sure why you're calling my take Euro-centric - if you mean "not Indian" or "white," then yes, I am those things, but if you mean "heavily influenced by European culture," then I'm not sure that's accurate, since I'm American and have certainly been influenced more by American than European cinema and literature. And more to the point, I think, I'm also not sure what in my response to the film qualifies as Euro-centric. Again, if you mean "white," then yes, that's my own cultural history/baggage/lens/whatever. Anyway. Yes, my lack of Hindi is always an issue, and the size/relevance/problematic-ness of that issue varies from film to film. This particular movie is certainly bringing out a range of reactions from people of various backgrounds, isn't it! I too felt very sorry for Sudha - as full of hope as she was, she made the wrong decision. I do wonder how much she realized at the time she made the decision (I don't remember if the film gives us a sense of that). My overall impressions that have lingered are, like you, how SLOW the dang thing was, and also a nagging little voice in my head saying "This is why people make fun of art films [from any culture]." I think if you look at the movie from a very practical mindframe- whatever you said will seem true- but this subject is much more emotionally dealt in this movie. And I totally feel this movie. I would like to write a much bigger Comment- explaining my thinking about this movie- but would put all those efforts once I confirm that someone is gonna read it. As this thread seems old. So please respond and then I will write my response. I think I am actually living a very similar situation in my real life and hence can explain a lot of things about this movie. Gee - I welcome your response! I often leave comments on posts authored long ago on other people's blogs - you never know when someone will first watch, or even re-watch, a film and have something to say about it! Please check this out. It was getting pretty intense and bigger - so added it as a new BLOG. I don't know how I missed this review of yours, maybe due to my disappearance from Blogland. 1. I simply LOVE the music, esp Katra Katra and Mera Kuch Saman. It might not have come out that well in the movie, or maybe the words were 'lost in translation', but those two songs are beautiful, in every way. 2. If movies could be said to depict reality, and they do not always do so, then, this movie was very real. I can sense a lot of irritation/anger in your review, which might be because you were disturbed by the way the characters acted, but looking at the movie as a real life situation, I see it as being very true to reality. If a woman takes time to realize that her husband carries his past with him and will not let go, or the past will not let him let go, then, she is not necessarily weak. A relationship is not a job, there is a lot of emotional investment, and decisions are not taken by careful analysis and deductions. 3. Agree that the movie is sad, but do not agree that there was no reason for it to be made. Relationships do not always happen between perfect, or matured, human beings, but every relationship is a story, and this movie explores that story. In real life, people are not perfect, and there are happy relationships/marriages between brats and doormats, or mamma's boys and dominatrixes...so there is no reason there cannot be movies on the same, and no reason why some people would not watch them. Movies are not made to showcase only perfect people. Whew, long comment...apologies if I got carried away. ijaazat- i beleive is one of the better made films in hindi industry. The character of maya is unreal if you view with the stereotype of how actresses ought to be. The script was extremely good. Music and lyrics were near perfect. Each character had its obsession and the ending was not a happily ever after. Naserruddin shah could never give up on the dream called maya. Rekha could not share her husband and was typically a possessive woman. While maya was that etheral thing who loved with all that she had but could never settle to one nest. Although much of why I disagree with your opinion of Ijaazat has already been said here (most significantly the role of the music and culture), I think your sense of indignation at the female characters is almost strong enough to override the positives of the film. The thing is, these roles aren't just stereotypes - a lot of people in the subcontinent know girls like Maya (although usually repressed) and Rekha's character. Hell, I recommended this movie to a friend who I STILL think is very much like Maya (at least superficially). Really, reading your review gives me such wonderful insight into how differing perceptions of gender roles can have such a tremendous impact. 'Ijaazat' isn't just 'obedience' - it is so much, much, more....and you'd be surprised at how many people don't see it as being a doormat. Needless to say, I really liked the movie...Naseeruddin Shah is king. And to think, I only watched it because I fell in love with a song. That has never ever happened in decades of watching Bollywood.